No salad is complete without spring onions. Being quick to crop, they are simple to grow and are an essential summer vegetable. Try growing the variety ‘Spring Onion White Lisbon’, the most popular variety with a characteristic bite and silvery skin. 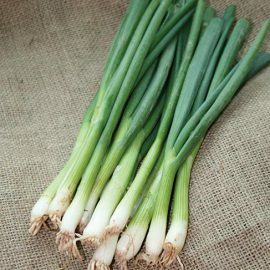 Spring onions like a sunny site and good drainage, but don’t like acidic soil, so add Garden Lime if necessary. Rake in some Growmore fertiliser before sowing. 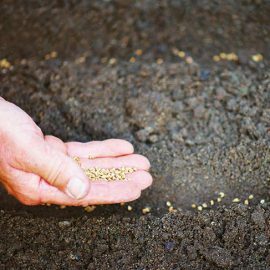 Seeds can be sown from March to July or from September to October and should be sown where you want them to grow (either directly into the soil, or in a pot/container). Allow 20cm (8 inches) between rows if growing in the ground. Sow regularly throughout the season to achieve a long harvest period. Hoe regularly to keep weeds down and water in dry weather. Feed with Westland Potato and Vegetable Feed. Spring onions are ready to harvest about 8 weeks from sowing. Simply pull them from the ground as needed. They cannot be stored for more than a few days.